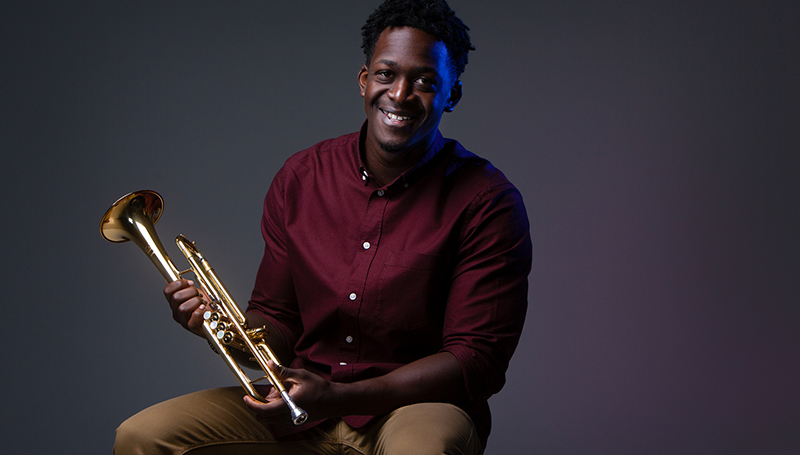 Campbell, a junior music performance major from Nassau, Bahamas, says he had a brief fling as a drummer, but the trumpet always seemed “cooler.” His talents on the instrument have not gone unnoticed. Freddie Green, Missouri Southern State University’s professor of trumpet, recruited Campbell to join the university’s music department. Now, he’s about to get exposure on an even larger stage. The Missouri Southern student will attend the Joshua Tree Music Festival – set for Oct. 4-8 in Joshua Tree, Calif. – to sit in with fellow Bahamian Selah Poitier and her band. The bassist/vocalist/songwriter is known for her unique style, which is a blend of jazz/hip-hop fusion, blues and funk, along with R&B, gospel, reggae and traditional music. Campbell says he plays with Poitier whenever he’s home, and there’s a possibility the upcoming festival performance with her band could become an ongoing relationship. He’s also looking to the future – one in which he’s able to do more than just perform.